Over the past 20-30 years, the way we work has been revolutionized. Our working processes have gone digital, and we have access to our data from many different devices. But the way we secure our data and log on hasn’t really kept up with the times when it comes to security. The default is still two little fields for a user name and password, even though many studies have shown that from a security perspective this is obsolete. The solution is called double-factor identification. In contrast to the analogue user name/password, this solution delivers complete security by making sure the right person is logging on. Security that becomes even more important as all types of transactions go digital. Until now, it’s been a challenge to get a smartcard with true digital identity to work on a tablet. The IT company Liga has worked together with the Security Lab at Denmark’s Alexandra Institute to develop the SmartSignatur Mobile SDK platform, which makes it much easier to develop security modules for a true digital identity. Alexandra Institute is a non-profit company that helps both public services and private companies adopt the newest IT research and technology. Bjarke Alling, the CEO of Liga Software, explains what the solution can do. In other words, the Alexandra Institute has taken something that would have once required 200 lines of code and replaced it with a software package that requires only 10 lines of code. This means that an app programmer can just focus on programming apps. The SmartSignatur Mobile SDK platform also makes true digital identity much more accessible – particularly for customers dealing with legal restrictions about access to data, such as municipalities. Imagine, say, a health care aide who works for a municipality and needs mobile access to data while out visiting patients. The aide can have her digital ID on a smartcard and can log on via a tablet from anywhere, allowing her to securely access sensitive information. “The mobility of a tablet is wonderful, but nobody wants to compromise on security. This is what we’ve addressed. You can be mobile without a lot of technical complications. The core of what we’ve done is to replace the analogue method of a password with a true digital ID. This means that your certificate is your user name, and your pin code allows you to log on to an IT system,” explains Alling. 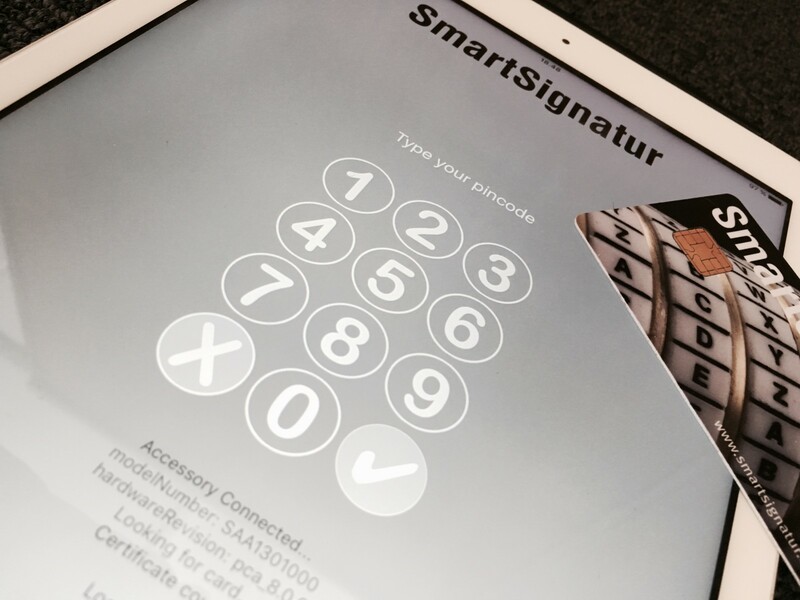 “What’s clever about the SmartSignatur Mobile SDK platform is that you only need one PIN. You don’t need a user name and password any more. We have made it possible to use an app to access data with a true digital identity from a mobile device in a secure fashion. And comply with all the legal requirements. It’s both more effective and more simple for the individual user,” explains Alling. Read more about Liga here. Access to the IT system is easier, because employees use a PIN instead of a user name and password that need to be constantly changed. A company can always be certain that it is the correct person using the systems. A user cannot be logged in to the same IT system from two different places. If you log on to your PC at work, you cannot be logged on from another office down the hall. This helps prevent fraud and hacking.